Having a meal at a place with a wide selection of food is what everyone wants. Introducing MEDZS, a Mediterranean place that features cuisines from Spain, Turkey, Morocco, Tunisia, as well as many other countries. This casual dining restaurant also offers a cashless concept in which you get a card, order your food with it, and pay for your bill at the exit. Starting off with a few starters, the Rosti topped with ham or smoked salon was crispy on the outside and fluffy within. We also tried a few tapas dishes but my pick is the pork belly which was oven roasted and caramelized evenly. We also tried quite a variety of mains since we were honestly very spoilt for choice with the wide selection of food. The Aglio Olio Pasta with Prawns was cooked al dente and seasoned nicely. I also liked the selection of thin crust pizzas they offer. The two dishes which i think you really should try is the Wagyu Sirloin and Grilled Prawns. The steak was cooked the way we requested it for - medium and seasoned minimally to bring out the freshness of the steak. The prawns on the other hand were sweet and juicy, accompanied by a tangy sauce. If there is one thing you should learn, it will be that you should always save space for dessert. We couldn't help but pick out the Rainbow Cake which was light and fluffy (and also very pretty). Apart from those, we also gave the 7 Decadent Sins a go. The platter features 7 devilish desserts, from rich cheesecake to velvety panna cotta. And if you are up for it, they also come with 7 different shots to match the desserts. In all, MEDZS is a place i recommend to go, especially when you are with a group of people. Reason being you can all order different stuff and share. Also, the prices are a lot lower than other cashless concept restaurants in town and the variety seems a lot more premium. Meet something i wake up to every morning - no, not the alarm clock. Instead, the Braun CoolTec shaver, a new shaver from Braun that promises you a completely different shave. Promising to be the solution for men with sensitive skin, the CoolTec is designed to take the heat out of shaving, leaving you enjoying a cold, icy shave. Being the world's first shaver with a cooling technology, the Braun CoolTec continuously removes the heat while you are shaving. This also means that it reduces the chances of skin irritation such as itching and redness, which is something one does not want to face every morning. This dry shaver boasts a adaptable 3-stage cutting system which ensures a efficient close shave. When the CoolTec technology is switched on, the cooling bar (in the middle) makes it feel as if you are shaving with ice (trust me, it is that cold). The shaver also works as a normal shaver if you do not switch on the CoolTec function. The chargeable shaver charges in an hour and provides up to 45 minutes of cordless shaving, 15 minutes with the CoolTec function. The best part of the Braun CoolTec in my opinion is the grip, which fits nicely in your palm. The shaver is also totally waterproof, which means you can use it while in the shower. It does not require any shaving cream or gel, which is a lot more convenient. This also means that you can fit it in your car, office or even your bag so you can get a shave at any time of the day or when you require one. Priced at SGD289, i don't see why any guy would complain - it is practical and an essential to men's grooming. Available from 1 November 2013 in Singapore, the Braun CoolTec will be available at all major electrical stores and departmental stores (check out the Braun Singapore Facebook Page for more updates). And also with the festive season round the corner, you probably could use this as a gift to your dad, brother or your partner. That time for the year is back, again. Halloween Horror Nights - the much anticipated event at Universal Studios Singapore is back for the third time this year. Expect better and more in-depth scare zones and haunted houses this year with new additions such as Monster Rock participating in this fright-fest. An addition to Halloween Horror Nights 3 this year is Monster Rock, where performers dress up as Halloween characters and perform top hits. Funny, and not scary at all, i reckon kids will enjoy this and the adults can give it a miss. The first haunted house, Adrift, is about a storm-battered ship found adrift after mysteriously lost at sea since 1910. 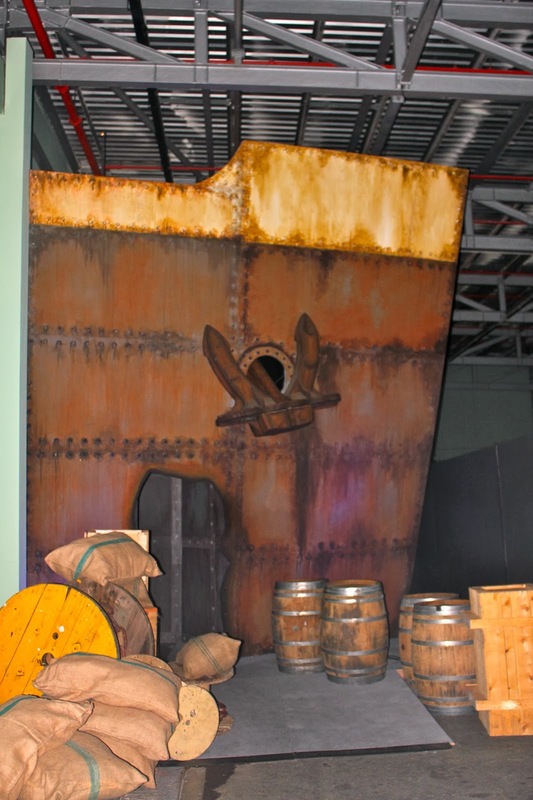 A walk through the ship brings you through areas you will find onboard a ship. In my opinion, the scariest out of all three houses, and also my favorite. The second haunted house and the least favorite of mine is Songs of Death, which is a chinese-themed. The whole outdoor setting made the place look less scary, and i reckon chinese ghosts don't really give off a frightening vibe. The last haunted house (literally, a house) is Possessions - a house for sale imprisoned by evil spirits. Honestly, i like the plot of this house as much as Adrift, but i felt Adrift looked like there was a lot more effort put into it. Nevertheless, you should go straight to this after Adrift. Besides haunted houses, Halloween Horror Nights 3 also has three different scare zones. And while photography isn't allowed in the haunted houses, they are allowed at the scare zones. Attack of the Vampires is a graveyard at Whittemore Cemetery which was once a charming town that turned into a graveyard. Convention of Curses is the least scary of the scare zones in my opinion. The scare actors seemed more magical and the whole zone has a lot of with craft and wizardry going on. My favorite of the scare zones is Forbidden Forest (on the way to Possessions). The dark forest is bound to scare you with scare actors lurking in the dark and camouflaging themselves in bushes. With three haunted houses and three scare zones, be prepared that the park is probably going to overcrowded, if not very very packed. Some rides will also be in operation apart from the haunted houses, in any case you were wondering. The park opens from 7pm till 1am, which gives you ample time to explore all the haunted houses, as well as some rides. Tickets are priced at SGD 68 for ordinary entry, or you have the option to top up to get an express pass, which i highly recommend given the queue at Halloween Horror Nights 2 last year. It runs for 4 weekends from Friday, 11 October 2013 so there is ample chance for you to catch this annual attraction. More information can be found on their website www.halloweenhorrornights.com.sg and word of caution for those who are asthmatic, please remember your inhaler.